Benjamin Kirby "Ben" Tennyson (voiced by Tara Strong and portrayed by Graham Phillips in the live action film Ben 10: Race Against Time) is the main protagonist of the series. He is a typical ten-year-old boy—he plays video games, rides his bike, and often gets into mischief. Gwen shares a love-hate relationship with Ben, insulting him with dry wit and sarcasm most of the time. She uses her laptop to research any strange people and/or creatures they might come across, and is a capable gymnast and has had some training in martial arts. She has also shown an almost innate skill in using various complicated devices or objects, such as in the "What If?" episode "Gwen 10", when Gwen gained the Omnitrix instead of Ben and proved to be far more adept in its use than he initially was. 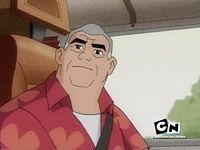 Maxwell "Max" Tennyson , or Grandpa Max as his grandchildren call him, is the 60-year old, rather overweight and a bit slow at times, paternal grandfather of the cousins Ben and Gwen Tennyson. With a keen sense for adventure and a strange taste in food (the only topic about which Ben and Gwen never argue), Max always ends up taking the kids on interesting trips. As soon as school lets out, Ben looks forward to going on a traditional summer road trip with Max in a motorhome nicknamed "The Rust Bucket", which Max has modified with advanced technology. The Rust Bucket is a replica of a GMC Classic Motorhome. In the live action Ben 10 film, Max is played by Lee Majors. Ultimos the Specimen Prime.The leader of his team, Ultimos is a Superman pastiche, complete with the same powers. His attitude is an ultra-strict copy of Superman, as well, as he follows the Galactic Code of Conduct too much to the letter and is prone to giving formal, stilted and overblown speeches, though he claims in the same episode that fighting villains in Ben's way is fun. Earth chocolate is poisonous to his species (in essence, his kryptonite), causing his body to shrivel and turn brown. Synaptak is a telekinetic, flying brain with an octopus-like lower body and a computerized face. He is initially jealous of Ben, as he has a crush on Tini but she loves Ben more, until he saves her life. He and Tini are hinted to have become much closer after that. Tini. The muscle of the three, Tini is a female Tetramand, Fourarms' species, and hence has the same powers, as well as better mastery over them. Her name (pronounced "tiny") might be considered a pass at humor, since she is approximately ten feet in height. She had a crush on Ben upon meeting him in Tetramand form (this persisted even after he had turned back to his original form), until Synaptak saved her life. Tetrax Shard, dubbed "Hoverboard" in his first appearance for his namesake flying device, is a Petrosapien mercenary, hired by Vilgax in the episode "Hunted" to take the Omnitrix from Ben. Coincidentally or otherwise, he also happens to be one of the type of aliens in Ben's Omnitrix. He has nearly impenetrable gray armor, a black helmet with a small, green triangle (presumably for sight) on it, and carries a large rifle. His Petrosapien physiology can manifest through the armor, allowing him to use his powers without removing it. Unlike the other hunters, Tetrax is allied against Vilgax. Upon first discovering that Ben has the Omnitrix, he laments the fact that out of the planet's six billion inhabitants, it would end up on the wrist of a child. He also berates Ben's lack of strategy in regards to its use. After helping Ben to defeat the other hunters, during which Ben learns to use the Omnitrix strategically, he decides that the Omnitrix is in good hands, allowing it to remain with Ben. He also gives Ben his hoverboard, which contained a message that revealed his real name, saying that it might come in handy. Ben uses it several times throughout the series (using it for the first time, at least on-screen, in "Tough Luck"). In Ben 10: Secret of the Omnitrix, the hoverboard is melted in a vat of acid, but Ben is given a replacement. These are neutral characters that are neither allies nor villains, or are not actually evil despite some selfish intentions. Carl is Max's son, Ben's father, Frank's brother, and Gwen and Ken's uncle, who works as a gas line engineer and holds some resentment against his father for his work as a plumber, which had taken him too often from his family's side. In Goodbye and Good Riddance he learns about the Omnitrix and his father's actual work the hard way when he is captured by Vilgax, but freed by Ben as Cannonbolt. He joins Ben, Gwen, and Max in fighting off Vilgax, setting off one of the gas lines and seemingly incinerating Vilgax. He and Max reconcile somewhat after that. JT and Cash are recurring bullies from Ben's school. JT is short and wears glasses, Cash Murray is taller and has darker skin. They are modeled after series producers Sam Register and Tramm Wigzell. The two take great pleasure in insulting Ben and suspending him by his underwear, though Ben returns the favor as XLR8 after coming into the possession of the Omnitrix. 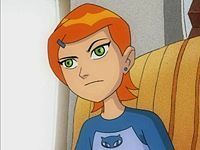 Julie Yamamoto is introduced in Ben 10: Alien Force as Ben's new love interest. She first appears in the first episode, where Julie congratulates Ben on his soccer win, sparking Ben's feelings. Sandra is Max's daughter-in-law, Ben's mom, Frank's sister-in-law and Gwen and Ken's aunt. In Ben 10: Race Against Time, she wants Ben to call her "Sandra", suggesting that he has freedom. She sometimes goes against that, only to have her husband, Carl, stop her from it. Vilgax is a Chimera Sui Generis, as well as a vicious, intergalactic conqueror, and he will stop at nothing to obtain the Omnitrix and use it to build an army capable of conquering every planet in the galaxy and alongside Kevin 11 and Doctor Animo the most recurring villain of the series. Vilgax serves as the main antagonist of the first season, responsible for half of Ben's enemies before appearing in person in the final episode of season one. The Forever Knights are a secret society first formed during the Middle Ages that is dedicated to collecting alien technology. Any aliens they capture along the way are dissected and studied, and any humans caught with them are immediately deemed worthless and disposed of. Their entire organization dresses as if they were knights, complete with the appropriate, albeit heavily enhanced, weaponry and stylized metal facemasks. They use a coat of arms over a pair of crossbones as their symbols. In their fourth appearance in "Perfect Day", a larger man in a full-body suit of armor called the Forever King is shown to be their superior. Kevin Ethan Levin is a mutant with the ability to absorb any type of energy and release it at will. The energy can be used to activate or overload various machines and can also be used to make energy blasts. When absorbing energy from the Omnitrix's aliens, he becomes an incomplete, but effective, version of that alien. In his first appearance in "Kevin 11", he is first encountered by Ben in an arcade, where he was assaulted by bullies and saved by Ben and XLR8. Zs'Skayr was trapped as one of Ben's forms, Ghostfreak, but escaped from the Omnitrix. His evil personality was trapped within the Omnitrix when his DNA was sampled. He finally manages to force his way out of the Omnitrix in "Ghostfreaked Out". For some reason, Ghostfreak goes by the name Ben gives him, and does not mention having a real name. After peeling off the protective layer of skin that normally covers him, he tries to take over Ben's body in order to become whole again.